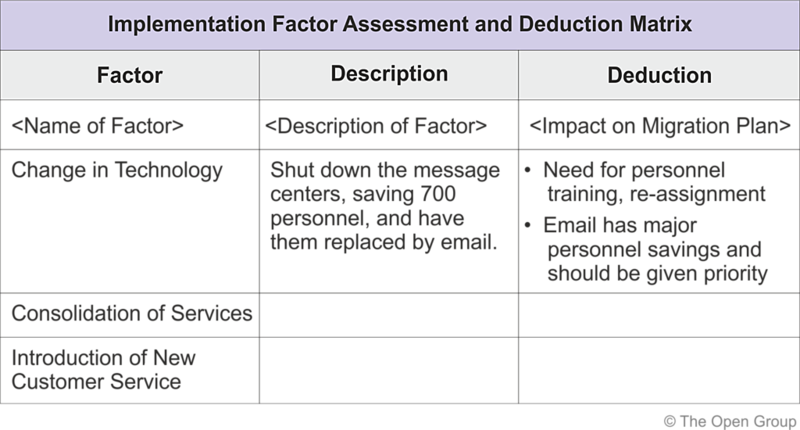 This chapter contains a number of techniques used to support migration planning in Phases E and F.
The technique of creating an Implementation Factor Assessment and Deduction matrix can be used to document factors impacting the architecture Implementation and Migration Plan. The matrix should include a list of the factors to be considered, their descriptions, and the deductions that indicate the actions or constraints that have to be taken into consideration when formulating the plans. An example matrix is shown in Figure 24-1 . The technique of creating a Consolidated Gaps, Solutions, and Dependencies matrix allows the architect to group the gaps identified in the domain architecture gap analysis results and assess potential solutions and dependencies to one or more gaps. This matrix can be used as a planning tool when creating work packages. 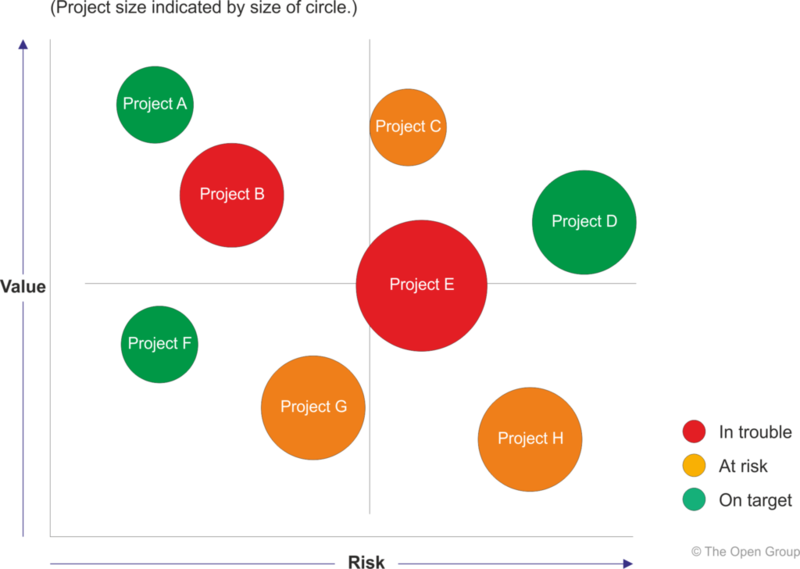 The identified dependencies will drive the creation of projects and migration planning in Phases E and F.
An example matrix is shown in Figure 24-2 . The technique of creating an Architecture Definition Increments table allows the architect to plan a series of Transition Architectures outlining the status of the Enterprise Architecture at specified times. A table should be drawn up, as shown in Figure 24-3 , listing the projects and then assigning their incremental deliverables across the Transition Architectures. The technique of creating the Transition Architecture State Evolution table allows the architect to show the proposed state of the architectures at various levels using the defined taxonomy (e.g., the TOGAF TRM). A table should be drawn, listing the services from the taxonomy used in the enterprise, the Transition Architectures, and proposed transformations, as shown in Figure 24-4 . All Solution Building Blocks (SBBs) should be described with respect to their delivery and impact on these services. They should also be marked to show the progression of the Enterprise Architecture. In the example, where target capability has been reached, this is shown as "new" or "retain"; where capability is transitioned to a new solution, this is marked as "transition"; and where a capability is to be replaced, this is marked as "replace". A technique to assess business value is to draw up a matrix based on a value index dimension and a risk index dimension. An example is shown in Figure 24-5 . The value index should include criteria such as compliance to principles, financial contribution, strategic alignment, and competitive position. The risk index should include criteria such as size and complexity, technology, organizational capacity, and impact of a failure. Each criterion should be assigned an individual weight. The index and its criteria and weighting should be developed and approved by senior management. It is important to establish the decision-making criteria before the options are known. Copyright © 1999-2018 The Open Group, All Rights Reserved. Not for redistribution.